Minnesota lies at the intersection of North America's prairie, eastern broadleaf forest, and boreal forest/peatlands. 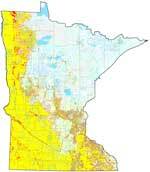 At the time of the Public Land Survey (1847-1908), Minnesota had 18 million acres of prairie. Today only a little over 1 percent of native prairie remains. 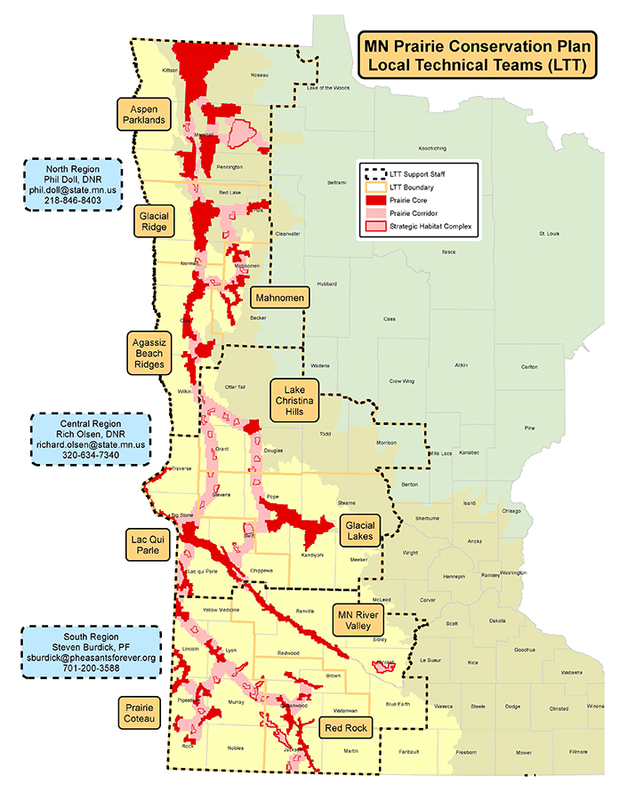 Minnesota's Remaining Native Prairie a Century after the Public Land Survey. Native prairie records 1847-1908 (shown in yellows and tans). Remaining native prairie mapped 1987-2017 (shown in red). This map, with supporting documentation, is available online. See "more information". 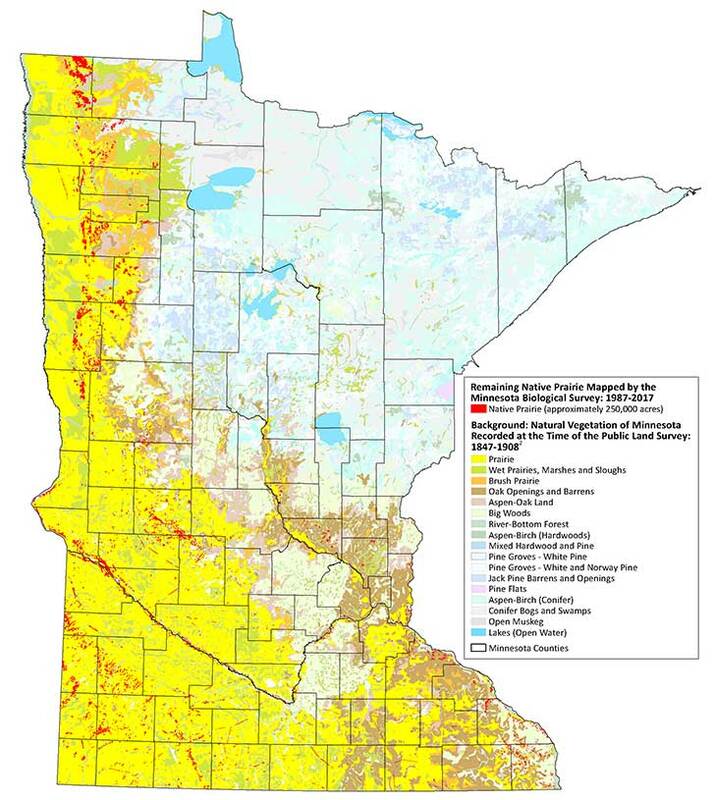 Core Areas: 5,000 to 300,000 acre landscapes (28 in total) that retain some features of a functioning prairie landscape and include 77% of Minnesota's remaining native prairie. Corridors: linear stretches of habitat 6 miles wide that connect Core Areas to each other and moderate the effects of a highly fragmented landscape. Agricultural Matrix: all the remaining area of the Prairie Region outside the Core Area. Prairie Plan Local Technical Teams (LLT) identify specific projects to help landowners select the best conservation options for their land. Protecting grassland and wetland habitat is one of the most critical environmental challenges facing Minnesota. The work will be costly, complicated and challenging to implement at every level. In response, a blueprint has been developed for moving forward – the Minnesota Prairie Conservation Plan (10mb). The Prairie Conservation Plan focuses efforts on grassland and wetland, and demonstrates unprecedented cooperation between federal agencies, state agencies and the state’s most active conservation organizations. The plan identifies core conservation areas and creates a vision of a connected landscape from Canada to Iowa. Prairie Conservation Plan–why is this needed? Conservation of the grassland/wetland landscape is needed due to accelerating demands for clean water, energy and arable land. Habitat fragmentation, loss of plant and animal species, degradation of soil and water resources, and invasive species are a few of the immediate threats to this system. Funding for natural resource conservation is strongly supported in Minnesota. One example is the passage of the Clean Water, Land and Legacy Amendment in 2008. A unified 25-year plan by multiple partners provides a more efficient future direction while also building on past conservation actions of a wide array of organizations and agencies. Protection: Maintain habitat through conservation easements on private land or acquisition of public land. Restoration: Grassland and wetland reconstruction to contribute to functional systems and viable species populations. Enhancement: Activities that improve habitats and functionality of a grassland or wetland (prescribed burning, conservation grazing/haying, control of invasive species). Coordinate conservation and management strategies to increase efficiency through this prairie partnership. Utilize local grassland implementation teams to gather input and impact local grasslands and prairies. Monitor progress toward grassland and wetland goals. 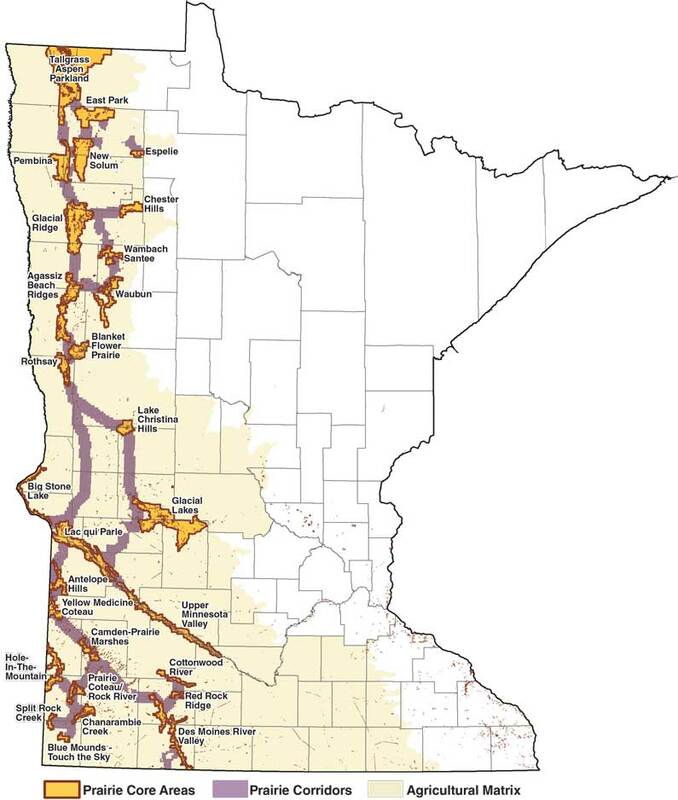 Organizations and agencies who were responsible for developing this plan: Lessard-Sams Outdoor Heritage Council, MN Board of Water and Soil Resources, MN Department of Natural Resources, MN Prairie Chicken Society, Pheasants Forever, The Conservation Fund, The Nature Conservancy, and the US Fish and Wildlife Service.